Catch Cuba while it’s still there, people say… Get a taste of the island and its revolutionary quirks before the opening-up of relations with the USA sweeps all its strange tropical-Soviet otherworldliness away, and it becomes just like any other country, like… (what? In this part of the world, maybe, the Dominican Republic, that shining success story). Cuba is different, something else, for good or bad, so get a look at it before globalised uniformity spreads there too. When you get there, it’s clear that Cuba has already changed a whole lot since the ardent heyday of the Revolution. Tourism seems to be the main (if not the only) growth sector in the economy, big hotels have been leased to international hotel corporations and in beach villages over half the houses are casas particulares offering rooms for rent, many of them morphing into small hotels. However, the idea that the thaw in US-Cuban relations – leaving aside the question of how this will pan out after the next US election – will obliterate all the particular ways of doing things Cubans have got used to in the 50-plus years since the Revolution and make the country ‘ordinary’ in just a few months seems pretty simplistic. And in the meantime, despite its now-more conventional appearance, Cuba’s regime can still surprise you with strange neo-soviet experiences. The Coppelia ice-cream parlour in Havana, the catedral del helado or cathedral of ice-cream, is one of the largest such places anywhere in the world, with capacity for over 1,000 customers at any time (theoretically). 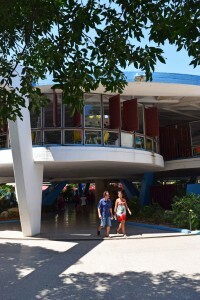 Opened in 1966, it was one of the most distinctive early creations of the revolution: the idea was that the Castro regime would show it could bring fun, joy and bright new things for the people, not just hard work and sloganising. 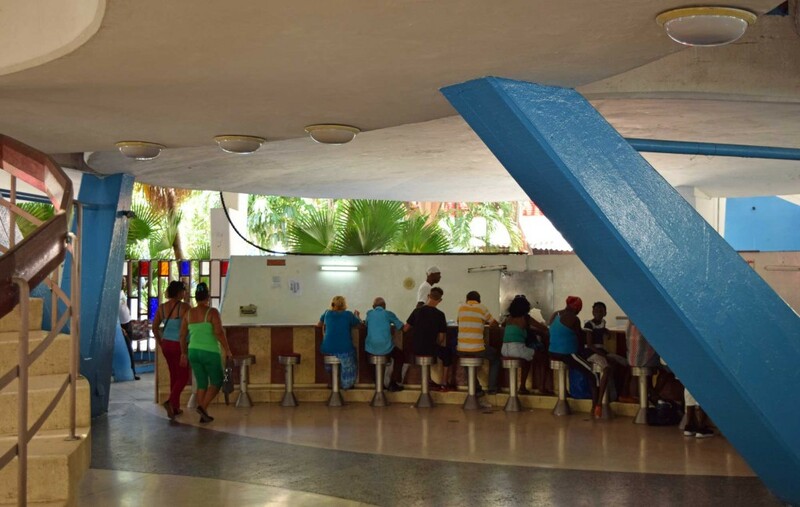 Built in the same Vedado district of Havana that in the ’50s had been filled with Mafia-run hotels and casinos, it initially offered over 25 flavours, as many as US commercial ice-cream chains, but at much lower, people’s prices. 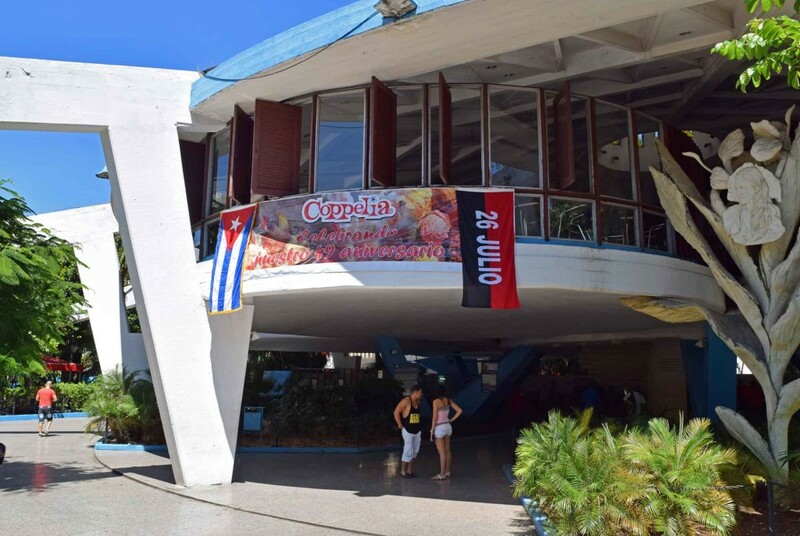 In the regime’s ‘good years’ of the 1970s and ’80s, when the economy ran relatively well on the back of subsidies from the old Communist bloc, a trip to Coppelia became a symbol of uncomplicated pleasure for ordinary Cubans, a national institution. 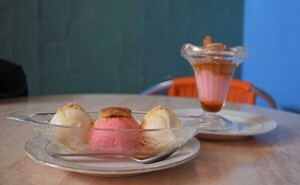 As such it features in the groundbreaking 1994 film Fresa y Chocolate (Strawberry and Chocolate), about a gay romance in the rigid atmosphere of 1970s Cuba, and named after Coppelia’s most popular flavours. Having got to Havana, and seen that Coppelia was only a few blocks from our hotel, we naturally wanted to try it out. 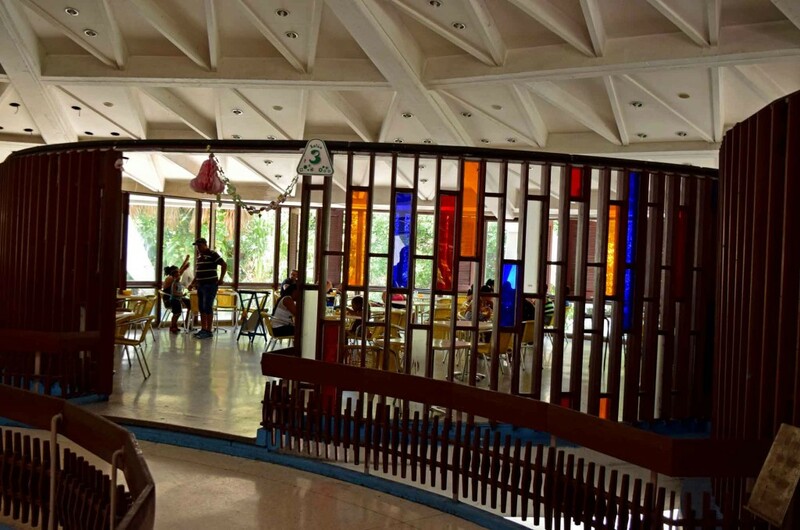 Coppelia occupies a whole Vedado block, with trees and lush little gardens in the gaps around the buildings. The main building is like a giant flying saucer raised on concrete pillars, an image of 1960s space-age, here-is-the-future modernity. Four giant arms reach out towards the corners of the block, forming the main entrances. And in each corner, from well before opening time every day we looked, there was a long line of Cubans, families, young kids, all sorts, waiting patiently under a blasting 35ºC sun to be allowed in. As we walked towards Coppelia we wondered whether we were supposed to join the wait, and whether we were really up for it in the fierce heat. However, we also saw an abundance of staff, some in uniform and some not, who of course immediately clocked our foreigner status. 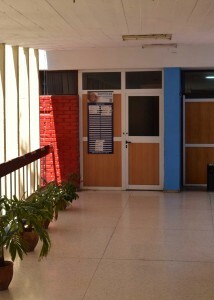 ¿Desea consumir?, asked one particularly severe lady in a white blouse with blue tabs indicating some seniority. Si, por favor, yes, er… un helado? (pretty superfluous, I know). Por allá, that way, with an authoritative wave directing us away from the lines and towards, we thought, a separate stairway we could see in front of us. But, ¡NO! she yelled, when we went to climb up it, por ALLA, pointing to another smaller staircase deep in the shadows beneath the flying saucer. We were passed between three different people before we eventually emerged onto a plain landing in a service section of Coppelia, and were led to an unmarked door that looked like an anonymous office. 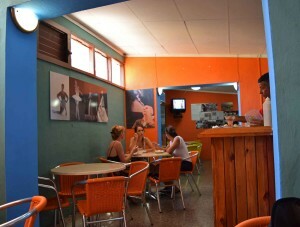 This was the foreigners’ room, where tourists are taken to sample the joys of Cuban state ice-cream. And, of course, we finally got to try the famous product itself. Menu boards at Coppelia still have space for the 25-plus flavours and even more combos the place offered when it opened, but for a long time, as every Cuban knows, only three have been available: the famous fresa and chocolate, and vanilla. They’re usually served together, three scoops in a little bowl topped with a few crushed nuts and a little honey. Perfectly nice ice-cream, it seemed to us, if a bit over-sweet (a Cuban taste). Nothing special, really – though if you’ve grown up in Cuba any time in the last 50 years, these three flavours probably set off a whole load of extra, subtle associations. We had sampled Coppelia’s ice-cream, but from our air-conned little box we had seen virtually nothing of the world-of-tomorrow fantasy architecture for which the ice-cream palace is just as celebrated. However, when we left the foreigners’ room, we saw across the landing a doorway through to the main section. Can we take a look through there, I asked a non-uniformed man standing next to it, we only want to see the building, and maybe take some pictures? Sí, ¿cómo no?, yes, why ever not?, he answered, as friendly as Cubans usually are when not on the spot to fulfil an official role. So, after all the rigmarole to get into the building, on the way out we were free to wander wherever we liked, through the pod-like areas on the upper floor with their stained-glass-style coloured panels, up and down the grand hardwood main staircase, and into the big, airy open space on the ground floor with its long metal ice-cream bar and ’50s-style stools. It is an extraordinary, unique place. And, just as strange, as we walked around not a single area was even half full, and there were empty seats and tables everywhere. While outside, as we saw as we left, the same long lines were still waiting resignedly to get in, struggling to catch some of the scant shade from the trees. • The regime knows foreigners want to see Coppelia and doesn’t want to turn them away completely. • However it doesn’t want them to join the queues, mix with ordinary Cubans too much or share the inconveniences of their daily lives either. So it came up with the foreigners’ room. What truly seemed beyond comprehension, though, was just why these same ordinary Cubans were obliged to line up for god-knows how long for their ice-cream, when the place was nowhere near full. After further thought I came up with another possible explanation that has a vague logic to it (like those above, this is purely a speculative theory, so alternative suggestions are perfectly possible). • Coppelia is a success of the Castro regime. Cubans love its ice-cream. However, the regime cannot supply enough of it to meet this demand. So, rather than cutting back demand by raising prices, which would challenge a basic principle, it does so by restricting admissions and forcing people to stand in the sun as uncomfortably as possible. At times like this you wonder what the hell the Castroist elite that runs Cuba thinks it’s doing. Getting ordinary Cubans to open up about how they see their country is hard. Many may be longing for drastic change. However, it’s also evident that for the moment the Castro regime can still call upon a residue of goodwill among a large number of people as well, who feel the regime has given them things they don’t want to lose: health care, the absence of crime, Coppelia ice-cream. But boy, does it like to try their patience.